Daiwa Tatula HLC is a compact, solid bait casting reel with Hyper Long Cast performance. The HLC model Tatula has a little deeper G1 duralumin spool to hold more line, and finely tuned HLC brake rotor, to emit the least brake needed. It has an innovative TWS T shaped level winder system to cast about 5 % longer by removing line friction at level winder in casting. The TWS line guide rotates by clutch to specify lines to pass the respective areas in casting and retrieving. The TWS on this Tatula has two sections, one narrow groove to lay lines onto spool, and the upper wide area for lines to pass without friction. Tatula has Magforce Z brake system, which emits adequate brake force automatically. The G1 duralumin shallow spool is light and it accelerates fast. 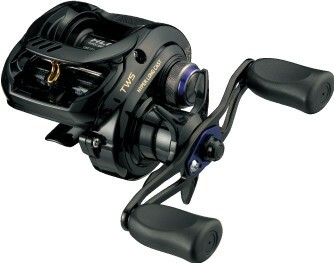 Compared to 2009 Daiwa Zillion HLC, Tatula HLC emit a little more brake and it is easier to handle. Jun's comment: This is the reel to cast the longest for heavier than 3/4oz the best, up to 40% more. One reported casting distance with this reel on vibration baits of 3/8oz, 1/2oz, 3/4oz, and 1oz sinker, Tatula HLC casted 46m, 53m, 56m, and 83m respectively. Fluorocarbon line 0.360mm dia, spooled 90m. This is about 30% more for 3/8-3/4oz vibration baits, and 40% more for 1oz than regular Magforce reels of Daiwas.